What kind of rivalries will develop in the early days of the B. League? Will former foes from the now-dissolved bj-league have the same spirited competition they did in the upcoming inaugural season of the new league? Will a former NBL team or two quickly emerge as a fierce opponent for the bj-league clubs designated to play in the 18-team first and 18-team second divisions? For instance, in the first division will the Akita Northern Happinets and ex-NBL club Levanga Hokkaido create an intense northern Japan rivalry? And what about two Tohoku teams assigned to the second division — the Iwate Big Bulls (bj-league) and the Passlab Yamagata Wyverns (NBDL)? Similarly, will the Yokohama B-Corsairs, the 2012-13 bj-league champion, develop a strong local bond on the court with fellow Kanto-based team Toshiba Brave Thunders in the first division, when the league begins play in late September? And what about the nine-team third division? Will those teams, including the Kanazawa Samuraiz, Rizing Fukuoka, Saitama Broncos and Tokyo Cinq Reves from the bj-league, plummet below the radar on the to-watch list for local fans and media? Will they garner enough sponsorships to survive beyond a season or two? Will they be able to retain, motivate and develop players to be competitive, especially because they are at the bottom of the hierarchical structure? In these uncertain, but interesting and exciting, times for the sport, how will the changing of the guard on many teams’ rosters affect the on-court product? Will the major influx of new players and coaches on new teams along with many returning players and coaches elevate the game or trigger a decline in the product? Will it take two or three seasons to see how the talent pool and coaching acumen mesh together in the new structure? Or will it take even longer? In the massive overhaul of Japan basketball that is taking place, there are many more questions than answers. Personnel moves: Longtime Iwate assistant coach Kensuke Hosaka, who joined the franchise in the 2011-12 campaign and worked as a translator and general manager (starting in March 2012) during its inaugural season, is leaving the team after five seasons. The club made the announcement on Monday, citing Hosaka’s expired contract. In a team-issued statement, Hosaka, 31, thanked the team for the employment opportunity. He said he was thankful for the fans’ support over the years and grateful for the memories from his time working for the Big Bulls. In related news, after an abysmal 5-47 season, the Broncos announced that head coach Ryutaro Onodera’s contract will not be renewed. Contract renewed: The Bambitious Nara have decided to retain sideline supervisor Kohei Eto for a second season, the team announced this week. Eto led Nara to a 17-35 record this season. 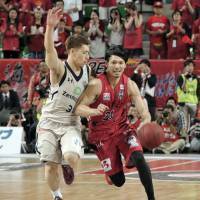 League honors: Asia-basket.com published its 2015-16 season awards on Wednesday. Ryukyu big man Evan Ravenel received finals MVP accolades and Sendai forward Wendell White was named the website’s Player of the Year. Other honorees: Toyama star Masashi Joho (Guard of the Year), Shimane’s Iwate’s Scootie Randall (Forward of the Year), Ravenel (Center of the Year), Joho (Domestic Player of the Year), White (Import Player of the Year) and Shinshu’s Xavier Gibson (Defensive Player of the Year). Title-winning mentor Tsutomu Isa of the Golden Kings received Coach of the Year honors. 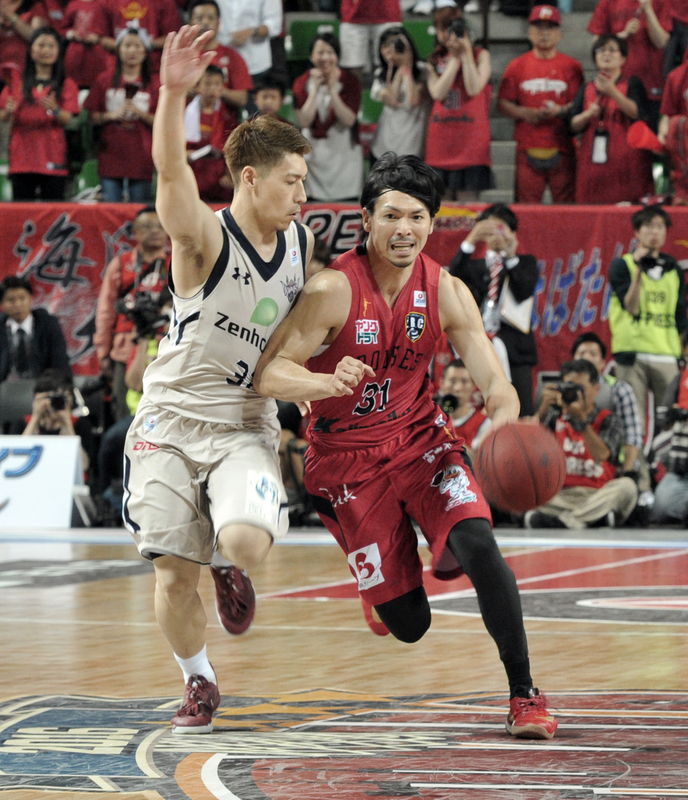 Offseason activities: Fukushima Firebonds forward Le’Bryan Nash, the league’s No. 1 scorer in its last season, is scheduled to participate in the Pro Camp Series basketball camps in Laredo, Texas, on June 11-12. Pro Camp Series utilizes the talents and experiences of pro football and basketball players, primarily from the NFL and NBA, as guest coaches to teach students ages 7 to 18 the skill sets used in those games. “I’m really excited to help sponsor these camps and be a part of something so amazing for sports youth in Laredo,” said City of Laredo District V Council Member Roque Vela, Jr., one of the event sponsors, in a statement.